To access the routing & tasks panel, the user must click the according icon on the navigation panel located on the left side of the screen. Its important to note that routing is interlinked with tasks and a planned route can be assigned as a new task. The Routing part is described first. When overviewing a vehicle the user can click the routing icon described in “Map features and tools” and the “Summary overview”. This will open the routing panel and mark the vehicle as “Destination A”, thus allowing to create a route for the vehicle from its start position. The first method: the user must start typing in the starting point in field “A”. The system will show suggestions with every letter the user inputs. Afterwards the user must type in the destination point in the field “B”. The second method is by clicking on the input field “A” and then clicking on the map on the desired location. The user will notice, that the courser has also changed the shape to “+” when on the map, this is made to indicate that point selection is on. After the point “A” is selected, the system will automatically move the selector to the next field “B” (or middle points if more are enabled), so the user can quickly select the next point. The user can edit points using the second method, by doing the following: click the route field that needs to be changed, and afterwards click the location on the map. This will overwrite the previous input. Important! The system will move to the next route point (if more are available) and the user can further overwrite subsequent points. To cancel point selection , the user must click on an empty space outside the map, but within the window. Web user vehicles can be used as a destination point when inputting the route address using the first method. Add more points – If the user desires to add a middle destination point, he can do that by clicking this button. This adds another destination to the Routing. The maximum number of destinations is ten. If the user wants to change the order of destinations, he/she can do that by simply click and dragging the destinations between each other. Show fleet – This slide bar controls the display of the users’ vehicle on the map. This can be either “On” – shows the fleet, “Off” – does not show fleet. Driving time rules – applies the following logic to the route calculation : 4,5 hours driving – 45 minutes rest – 4,5 hours driving – 11 hours rest – repeat from beginning (this rule is enabled by default). Search for vehicle radius (max 200 km) – the user can input an integer numerical value, which will define the radius in kilometers. The system will search for vehicles (vehicles with status “No signal” are not included) around the “A point” (start point), within the defined radius and will display the closest one in the route summary with the ability to select other vehicles within the defined radius. The search circle will be displayed on the map. Add to start point – clicking this button will add a new start point to the rout, which is the current vehicles location, the previous start point will shift down in the list. The currently highlighted route on the map will be highlighted in blue, possible routes will be displayed in white. The user can click other routes either on the map or in the panel to select them. If “Driving time rules” is selected in the settings, approximate stops will be displayed on the map. If a vehicle is available within the specified search radius of the route starting point, a button will appear at the bottom of the panel called “Create task”. Clicking this button will open a “create new task” form for the nearest vehicle to the starting position (if more than one vehicle is nearby). To create the task for a different vehicle the user must select a vehicle at the top of the screen. The “Create new task” window is described in the next section. 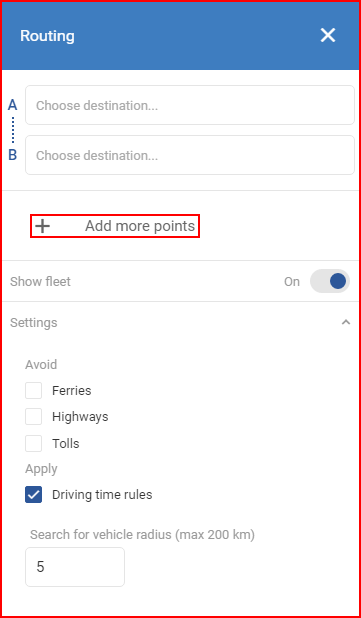 Task creation starts in the “Routing” TAB, clicking the “Create new task” button in the “Tasks” tab will navigate the user back to the “Routing” tab to create a route first with a vehicle available nearby. With the introduction of the “Orders module“, user are now able to assign previously created order task via the “Routing & Task” menu. Once this menu is opened, previously created order task will be displayed on the map as shown below. The “Up arrow” marks a pickup, while the “Down arrow” symbolizes a delivery point. Moving the mouse over one of the points will highlight both the pickup point and the delivery point and show additional information regarding the cargo. 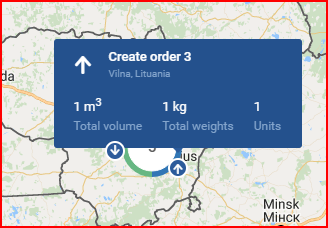 Clicking one of the points on the map, will select this order task and suggest a route for it. A additional panel with the route and cargo information will appear. If a order task is used for a route, the destination points cannot be moved in such a way that the delivery point comes first before the pickup point. The system will not allow this change. To select several order task, after the first order task is selected, the user must simply click the next pickup point on the map, once clicked, the route will auto adjust to provide the most optimal route, as well as add the delivery and pickup points to the destination points. Up to 5 order task can be included in one route. To remove an order from the route, the user must remove one the points of the order from the destination points in the sidebar on the left. Once one of the points is removed, the whole order is removed from this route.